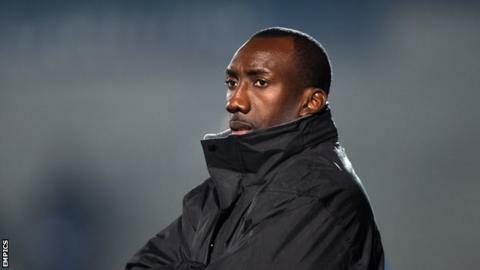 Burton Albion manager Jimmy Floyd Hasselbaink has said that his side's "DNA is young" as they prepare for their first season in League One. Hasselbaink, who led Burton to the League Two title, told BBC Radio Derby: "Our DNA is young, energetic and [the players] want to prove themselves. "They are hungry and want to learn, they want to take this club forward and grow with this club. "That's what we want, that's what the club stands for and what we stand for." The Brewers lost 3-1 to Derby on Saturday in their final pre-season friendly and lost midfielder Kelvin Maynard to a serious knee injury that could keep him out for the whole season. Hasselbaink has made 11 summer signings and could strengthen further, adding: "There might be one or two still coming in but I'm happy where we are now. "We've lost Kelvin and have to have a look in that area, we definitely need another striker, maybe two and then I think that will be more or less us." Burton start their League One campaign at home to Scunthorpe United on Saturday. The former Leeds, Chelsea and Netherlands striker said: "Whatever the style will be the most important thing is the winning kind of style with a little bit of flair."